Rockey’s New Age Home Biltong Maker is ideal for those people who like their Biltong so much that they need to make it in larger quantities then the famous Biltong Buddy Home Biltong Maker allowed. The two new RNA Biltong Makers will also enable those people making Biltong on a small commercial scale to increase their output to satisfy a larger number of customers. 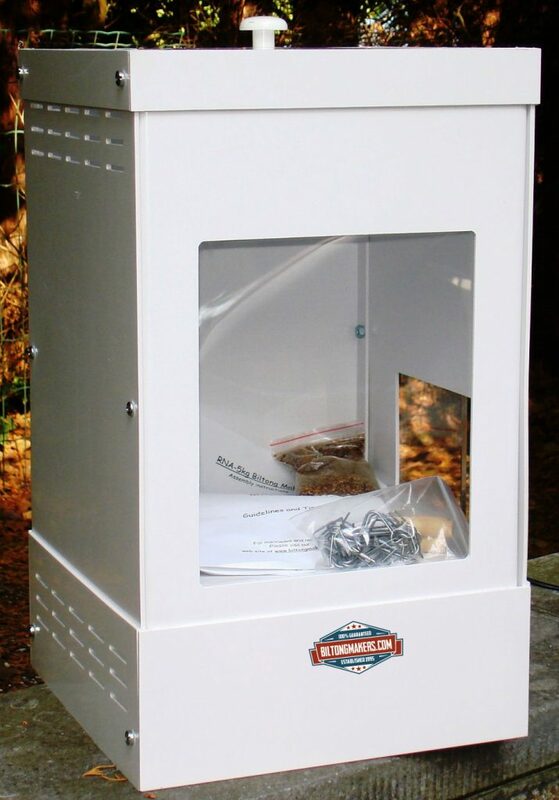 Rockey’s New Age Home Biltong Maker is made of an extremely strong 4mm ABS material (as used inside a fridge) which dries your meat in perfect hygienic conditions and also makes the machine very easy to clean. It measures 265 (L) x 305 (W) x 495 (H) mm and weighs around 4 kilograms (packed size 180 x 580 x 340 mm – 6 kg). It comes in kit form and is very easy to assemble. Full instructions come with the package. The machine makes use of a 40 watt globe to supply the right temperature to dry the meat. The globe gives a constant heat, just enough to simulate the natural drying conditions that you would find in the Southern African countries. Now, at last, you will be able to make enough Biltong for all your friends and family and even have some left over for yourself! It’s our 23nd birthday this year but why should WE get all the presents? Here is what we’ll do for you! These are the regular retail prices. That’s a whole whack off the normal retail price for both models! So, use the currency converter on the top right to see what it would cost you, in your country. Both Home Biltong Makers come complete with free sample spices, instruction booklet, biltong hooks and dowels. The above pricing is valid only for as long as our current stock lasts of course. With the price you pay for biltong right now this Biltong Maker will pay for itself in one or two batches! And …. you can make it just the way you like it! !